Cact. Aliq. Nov. Desc. p. (1831). Accepted Scientific Name: Cephalocereus senilis (Haw.) Pfeiff. Allg. Gartenzeitung (Otto & Dietrich) 6: 142. 1838 Otto & A.Dietr. 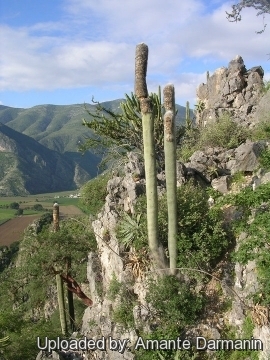 Growinh habit at San Cristobal, Hidalgo, Mexico. 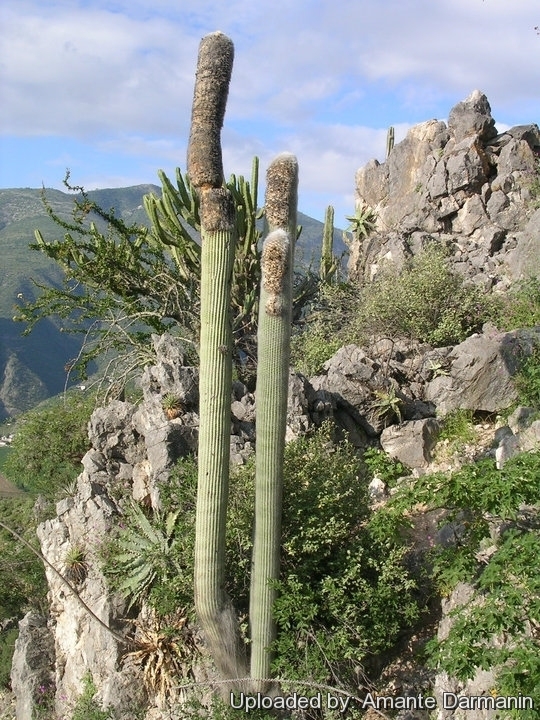 Origin and Habitat: Cephalophorus senilis is endemic to Mexico, where it is distributed only in the states of Hidalgo and Veracruz (extent of occurrence is approximately 2,170 km2). Habitat and Ecology: The species is restricted to calcareous canyons within xerophile vegetation, and is one of the dominant elements of the xerophile scrub where it grows. The house finch eats the fruits/seed in June, July and November. It.is very common on limestone hills of eastern Hidalgo, where it is often the most conspicuous plant in the landscape. Large individuals are common here and are often 15 meters high. This species is locally abundant, but there is a continuing decline in mature individuals. This is one of the most commonly used succulent species for ornamental purposes. It is removed from the wild and cultivated. Over-collection of juveniles is also an ongoing threat and likely causing an imbalance in age distributions of sub-populations. The cephalia of this species is cut to obtain fruits and seeds. The species may be at risk from pastoral agriculture. 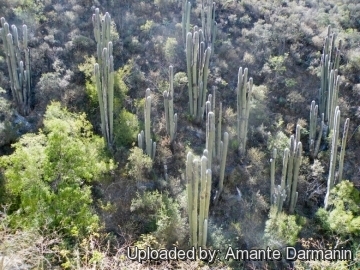 Description: Cephalophorus senilis is a columnar and erect cactus 6 to 10 or even 15 meters high, simple or branching only basally. The flowering areoles develop an abundance of wool which confluently forms a dense mass called a pseudocephalium at the top or on one side near the top. The flowers are nocturnal red, yellow, or white, though the plant may not flower until 10–20 years old. The fruit usually are obovoid. The most striking feature is the shaggy coat of long, white silky hairs suggestive of unkempt hair on an old man and hence the name old man cactus, and similar names. The coat is a particularly striking silvery white on the young cactus; as the plant ages the stem begins to lose its covering. The hairs are modified spines and they make many a plant appear almost snow-white; they serve to protect the plant from frost and sun. However, the hairs are only the radial spines of the cactus; they conceal formidable sharp yellow central spines that belie the inoffensive appearance of the hairy covering. Stem: Cylindrical, columnar, light to bright green, becoming grey, to 30 cm in diameter, sometime branched from the base, top rounded. The individual stems are usually unbranched, being unable to withstand the weight of side branches adequately. The ribs are numerous (20-30), low, slightly notched. Very little wood-tissue is developed and the largest individuals can easily be cut down with a pick or small knife. This species undergoes profound changes in the upper parts of the trunk at maturity (about 15 years). Tissues from that part change to originate an area specializing in the production of flowers (lateral cephalium or pseudocephalium). Pseudocephalium: Developing on plants when about 6 meters high, broadening above, at first confined to one side but later encircling the top of the plant. The flowering zone in the lateral cephalium is characterized by its interareolar space reduction, areole size increment, and high production of long bristles and woolly hairs in the areoles (The bristles of the pseudocephalium are dense, white, twice as long as the wool). Moreover epidermis lacks of chlorenchyma (photosynthetic tissue) . The lateral cephalium of C. senilis shows modifications previously reported for the Espostoa species with lateral cephalium. Areoles: 7 mm long by 5 mm wide, closely set (12 to 14 mm apart); the ones at base of old plants producing 20-30 weak, hairlike, white or greysh bristles (modified radial spines) 6-14 cm long, the ones in the pseudocephalium producing similar but shorter bristles intermixed with dense, tawny wool, 4 to 6 cm long. Central spines: 1-5 (mostly 3), stout, yellowish to greyish, 1-5 cm long. Flower: The flowers are nocturnal, solitary and grow one by one. Funnel shaped, including the ovary, 5-9 cm long, 7-8 cm in diameter, yellowish pink to rose-coloured. Pericarpels and floral tubes hairy with few scales. Cephalocereus senilis (Haw.) Pfeiff. 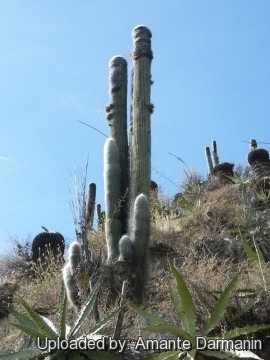 : Commonly known as the old man cactus, it is a tall columnar cactus with long, greyish-white hairs which serve to protect it from the harsh sun common to its native habitat in eastern Hidalgo, Mexico. Cephalocereus senilis f. cristatus: Beautiful crested form. The most striking feature is the long, greyish-white hairs. 2) Wikipedia contributors. "Cephalocereus senilis." Wikipedia, The Free Encyclopedia. Wikipedia, The Free Encyclopedia, 18 Nov. 2016. Web. 23 Feb. 2017. 3) Guadalupe Martínez, J., Sánchez , E. & Bárcenas Luna, R. 2013. Cephalocereus senilis. The IUCN Red List of Threatened Species 2013: e.T152158A604029. http://dx.doi.org/10.2305/IUCN.UK.2013-1.RLTS.T152158A604029.en. Downloaded on 24 February 2017. 4) Arias, S., U. Gúzman, M.C. Mandujano, M. Soto Galván, J. Golubov. “Las especies mexicanas de cactáceas en riesgo de extinción.” I Una comparación entre los listados NOM-059-ECOL-2001 (México), Las Lista Roja (UICN), y CITES. Cactáceas y Suculentas Mexicanas 50(4): 100-124.2005. 5) Casas, A. “Uso y manejo de cactáceas columnares mesoamericanas.” Catáceas y Suculentas Mexicanas XLVIII(1): 11-18. 2002. 6) Casas, A. and Barbera, G. “Mesoamerican domestication and diffusion.” In: P.S. Nobel (ed. ), Cacti Biology and Uses, pp. 143-162. University of California Press, Berkeley. 2002. 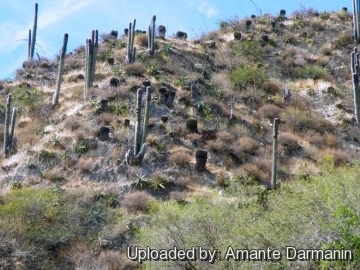 7) Hernández, H. and Godínez, H. “Contribución al conocimiento de cactáceas mexicanas amenazadas.” Acta Botánica Mexicana 26: 33-52. 1994. 8) Hernandez, H.M. and R.T. Barcenas. “Endangered Cacti in the Chihuahuan Desert: II. Biogeography and Conservation.” Conservation Biology 10(4): 1200-1209. 1996. 9) Hernández, H.M., Gómez-Hinostrosa, C. and Goettsch, B. “Checklist of Chihuahuan Desert Cactaceae.” Harvard Papers in Botany 9(1): 51-68. 2004. 10) Hunt, D., Taylor, N. and Charles, G. (compilers and editors). “The New Cactus Lexicon.” dh Books, Milborne Port, UK.2006. 11) Medina Cepeda, J.G. “Herramientas técnicas, tecnológias y de gestión en la empresa familiar mediana y pequeña del distrito en el sector de las flores y plantas y muebles y madera.” Facultad de administración de empresas, Universidad de la Salle, Bogotá. 2004. 12) Mendiola González M. E. and R. Ortiz-Pulido. “Impacto del sobrepastoreo en la comunidad de aves de la Reserva de la Biosfera Barranca de Metztitlán, Hidalgo, México.” 2006. 13) Reyes Santiago, J., R. Castro Gonzalez, S. Mera Banda and C. Brachet Ize. “Nota sobre el establecimiento de un vivero rural para la propagación de cactáceas y suculentas en el Valle del Mezquital, Hidalgo.” Cactáceas y Suculentas Mexicanas XLVIII(4): 118-126. 2003. 14) Robbins, C.S. and R.T.Bárcenas Luna. “Prickly Trade:Trade and Conservation of Chihuahuan desert Cacti.” In: Robbins, C.S. (ed.). TRAFFIC North America World Wildlife Fund. 2003. Cultivation and Propagation: It is easy to grow. Need a fertile, well drained soil mix. Water the plants well and allow them to dry before watering again. This species seems to do better with a little more water than most cacti. During the growing season fertilize them monthly with a balanced fertilizer. It may produces noticeable amounts of growth each year if kept well fed and watered throughout the warmest months, particularly if it has been acclimatised to accept full sun. Once this cactus is established it can easily produce 20 cm of growth every year. Sun Exposure: Outside full sun, inside needs bright light, and some direct sun. Winter rest: During winter month, put them in a cool luminous place and encourage them to enter winter dormancy by withholding water and fertiliser over the winter as they will etiolate, or become thin, due to lower levels of light. It is hard as low as 0 °C (or less) but it is best a warm habitat means that a minimum of 10°C should be maintained to avoid marking of the stem. Pests and disease: They are susceptible to fungal diseases if overwatered, but are not nearly as sensitive as many other cacti, especially in warm weather. If kept damp through cold periods, they will invariably suffer. Use: The species is used for wood and juveniles as ornamental. Propagation: Cutting or seeds. The seeds are quite easy to germinate and grow. Their main requirements consist of high humidity levels, free-draining soil mix, and enough water, light, and nutrition.